Gone are the days of grandchildren growing up next door to or down the street from their grandparents. The opportunity for these youngsters to learn from their elders has diminished. 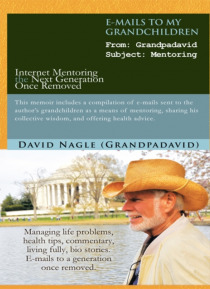 But author David Nagle found a way to mentor his grandchildren and be a practical source of wisdom. He sent them e-mails. In E-mails to My Grandchildren, Nagle shares a collection of these e-mails that served to inf… orm his grandchildren, giving them a sense of their roots. Offering a sophisticated spectrum of mentoring advice, the e-mails contain an entertaining mix of personal stories of growing up in another age, grandfatherly advice about living fully, and information about how to stay healthy. Meant to be savored and read again and again, E-mails to My Grandchildren challenges Nagles grandchildren to learn new things and to learn new ways of thinking about old things. This sampler of warm, biographical stories is both timely and timeless.